Have an extra iPod? Donate it to a cause that brings music to patients with dementia — it very well may bring them back to life. Hint: There is a video at the end of this article that will make you want to cry happy tears. With countless scientific treatments for Alzheimer’s disease, perhaps the most profound one comes by way of an iPod. The devices are being distributed to nursing homes across the country as part of Music & Memory, a nonprofit in New York that provides music therapy to dementia patients. The iPods are loaded with songs from the patients’ generation. When patients listen to the music, it sometimes causes them to start speaking again and express emotion — something routinely numbed by drugs they’re often put on. 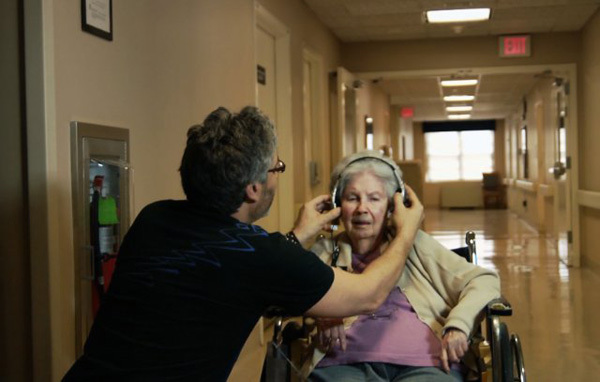 The program started a few years ago when Dan Cohen, a social worker, wanted to explore the effect music had on patients with dementia. Michael Rossato-Bennett, a filmmaker, documented Cohen’s initiatives over a three-year span, which helped get the word out about the organization (as did a KickStarter campaign). So far, however, only about 60 facilities in the U.S. are using the program, so there is a huge need for more help. Rossato-Bennett’s creation, Alive Inside, won the 2014 Audience Award for U.S. documentary at Sundance, garnering more support for Cohen’s initiative. Several studies have confirmed the connection between music and cognitive disorders. They have found that the music can help stimulate the brain and bring back emotions. Why does it matter? Because many patients with cognitive issues are often put on medication that can sometimes leave them in a vegetative-like state. “Even though Alzheimer’s and various forms of dementia will ravage many parts of the brain, long-term memory of music from when one was young remains very often. So if you tap that, you really get that kind of awakening response. It’s pretty exciting to see,” Cohen said. It’s kind of something you have to see to believe, so here is a video that shows the impacts of the music. You can see that it stimulates activity in parts of the brain, re-awakening some patients that have been completely silent for years. Not only does it combat memory loss, but it has also given new hope to the nursing home system, which is often devoid of personal connections. Next time you hear about someone with Alzheimer’s or dementia that could use a lift, consider hitting up iTunes and cruising around for a few “oldies” hits. It could be just the thing that makes the patient feel alive again. Place iPod and charger cord in the smallest envelope or box possible with adequate padding. Keep the earbuds. We supply residents with headphones. Seal the package, affix the mailing label and drop in the mail.